Whether you are operating an outdoor equestrian arena, a stable, or perhaps both, you already know how much of a nuisance mud can be. Not only can it make life difficult on your horses, making it harder for them to trot along, it can also create a mess around the barn or area. But did you know that mud can also reduce grazing areas for your horse and even lead to erosion — a problem which just leads to a whole host of other issues? Indeed, mud is one of the biggest issues facing horse barns and equestrian riding arenas all around. 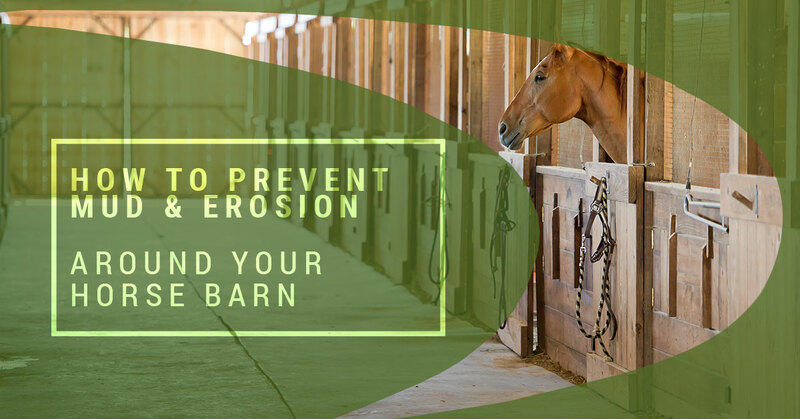 That’s why you need to understand that there are some effective methods for erosion control in your horse barn and/or arena. In this blog, we’re going to be covering a few tips on how to prevent mud and erosion around your horse barn — not just for your safety, but for the safety of your horse companions. Keep reading to learn more about erosion control in and around your equestrian arena and barns, and contact B8 Ventures today to get started with Ecoraster products that are built for permeable, eco-friendly ground stabilization. One of the quickest and easiest ways to prevent mud, and ultimately erosion, in your horse barn and/or riding arena is to gauge and assess the environment on a daily basis. Consider a number of factors when performing your daily maintenance, such as whether it rained, how efficiently the ground water drains, and whether or not the conditions are conducive for your horse’s overall health. Make improvements whenever and wherever you can, paying special attention to the conditions after a rainstorm to ensure that you know whether or not water is pooling or draining in the area. Ideally, the water won’t pool or runoff in a way that will lead to large mud puddles and erosion — rather, it should move through the ground efficiently in a way that fosters grass growth and a stable ground layer. If you are managing both a riding arena and a stable/barn area, then it’s important to keep a delicate balance between the two areas. Be sure that you take it easy every once in awhile, meaning that you allow the ground to take breaks from that heavy foot traffic. The more relentless foot (or more accurately, hoof) traffic there is, the higher the chances of erosion, wear, and tear. This is particularly important in the event of a rain storm — be sure to let your arena properly drain and dry before trotting around the area. Capable of holding up to all weather conditions, heavy foot and hoof traffic, and just about anything else thrown at it, Ecoraster erosion control matting is ideal for protecting against the elements — both natural and man- (or horse-) made. Ecoraster geogrids are environmentally friendly, made from 100 percent recycled materials, and provide sustainable, permeable ground support for areas that need it most. That includes equestrian barns, riding arenas, and just about any other area that may otherwise be susceptible to the effects of mud and/or erosion. Just dig to create a sub-base layer beneath where your arena will exist and install your erosion control matting (pro tip: the interlocking system makes installation a breeze). Then, cover the Ecoraster grids with your preferred top layer and start riding on a sustainable, permeable, and reinforced surface. This state-of-the-art erosion control matting not only helps remove mud from high-traffic areas, it also acts as an insulating base to keep your horses comfortable in all climates. Learn more about permeable ground reinforcement and erosion control for horse arenas and contact B8 Ventures today.